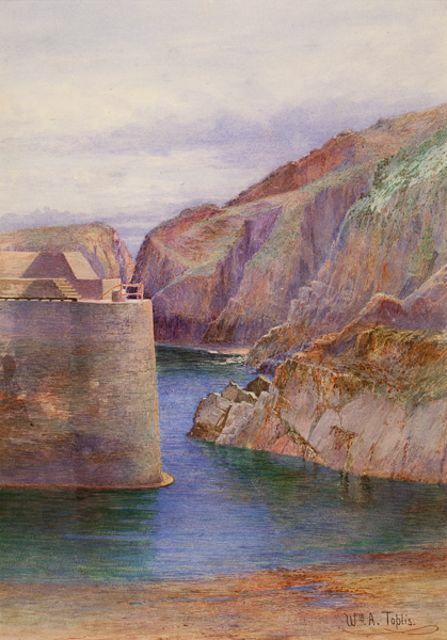 This watercolour is one of the twenty-one original paintings by William Arthur Toplis reproduced as illustrations in The Book of Sark, published in 1908 by Hodder & Stoughton. Toplis' friend the journalist, novelist and poet, John Oxenham provided the text to accompany Toplis' intricate depictions of the island. There were also essays on the geology and flora of the island by Professor T G Bonney and E D Marquand. Recently a limited Centenary Edition of The Book of Sark was published, printed from the original plates in the possession of the artist's family. Copies of the Centenary Edition can be ordered via the Guernsey Museum shop.